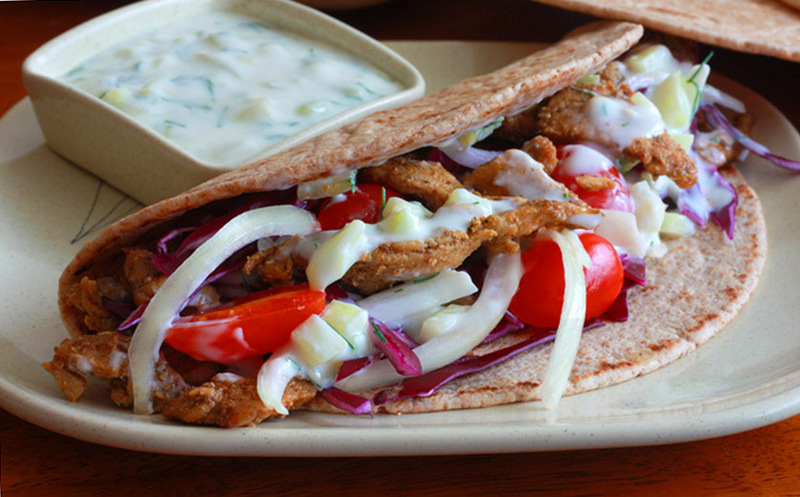 Love those street corner gyros but not sure what's in them? Well, now you can make your own with all natural ingredients. Process the onion in a food processor for 10-15 seconds and turn out into the center of a clean towel. Return the onion to the food processor and add lamb, garlic, marjoram and process until it is a fine paste, approximately 1 minute. Stop the processor as needed to scrape down sides of the bowl. Place the mixture in a loaf pan, making sure to press into sides of the pan. Place the loaf pan into a water bath and bake 60-75 minutes, or until the mixture reaches 165-170 degrees F.
Remove from the oven and drain off any fat. Place the loaf pan on a cooling rack and place a brick wrapped in aluminum foil directly on the meat and allow to sit for 15-20 minutes, until the temperature reaches 175 degrees F.
Slice and serve on pita bread with tzatziki sauce, chopped red onion, spinach, tomatoes and feta cheese. Place the chopped cucumber in a colander and sprinkle with kosher salt and allow to sit for at least 30 minutes to remove the moisture. Rinse salt off cucumber and place in a clean towel, gather ends of towel and squeeze moisture out of cucumber. In a mixing bowl, combine the yogurt, cucumber, garlic, basil and lemon juice. Season with salt and white pepper. Store in refrigerator in an airtight container for 1 week. Yields: 1 1/2 cups.